A pretty dopey action movie, full of cliches and way too convenient moments, that still manages to be kind of fun. 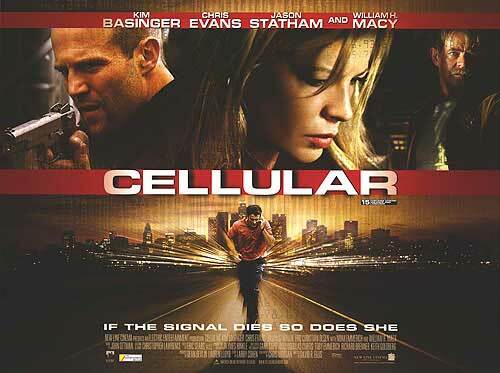 Cellular is absolutely one of the most predictable movies I’ve ever seen. Between this and safe house, the denzel washington c.i.a. film, i think the two movies manage to cover every cliche in the book. and just like that film, the one thing this movie really has going for it is it’s initial premise. if movies were judged based on a simple tagline for what the film was about, this one would be a winner. it’s got that whole “what would you do,” situation going for it and finds a way to put itself in the current world of technology while still being incredibly simple. that basic premise finds a kid picking up his cell phone to hear the voice of a woman who has been kidnapped. she was able to dial him by crossing wires together from a destroyed telephone and seeing what would happen. never mind whether there is any plausibility to this or not, and whether you could actually dial up a random number that way (something tells me you can’t), the idea is still kind of fun. especially in the way that it really puts the viewer in the shoes of the main character. this main character, ryan, (chris evans) is a hero. he’s a good guy and he spends the entire movie trying to help this stranger out. at first, of course, he thinks it’s a prank until he hears the bad guys bust down the door, come in, and threaten the woman (kim bassinger.) for bassinger, this is her first big role in a while. probably since her oscar turn in l.a. confidential. too bad this happened to be such a b kind of movie. for evans it was also a milestone film. this was his first big movie, not including the silly spoof, not another teen movie. Cellular might be kind of dumb, but it is the movie that proved to some people in hollywood that evans could carry a film as the star. this movie was nearly a decade ahead of him being cast to play captain america, one of the most beloved super heroes of all time. the problem with Cellular is that it’s a very shallow film. there isn’t anything going on here that we haven’t seen before (except for a hero who stays on the phone the whole time.) what sounds like it could possibly make for a cool premise ends up actually giving this movie the opportunity to become very lazy. you see, in most movies of this sort, the hero would get wind that there was something going on, that a woman had been kidnapped, and then have to track her down. he would spend the movie trying to put together clues to find the woman. only because this movie has ryan stay on the phone with the woman the whole time, she is able to just tell him where to go. he doesn’t have to put any clues together himself at all. so, for example, she tells him where she is supposed to be meeting her husband and at what time. it’s at an airport bar, and ryan shows up hoping to meet the husband before the kidnappers do. he blows that one by grabbing a guy and shoving a phone in the guy’s hand without ever asking, “is your wife jessica?” sure, just grab a stranger and hope he’s the right guy. ridiculous. it’s one of many blunders this movie makes. the movie is lucky enough to have good actors on board, helping it out whenever they can. jason statham plays the movie’s villain. he’s the head kidnapper and has never been more evil than he is here. statham of course, has gone on to be his own action hero movie star, making lousy b movies on a regular basis. sometimes they even spawn sequels like the transporter or crank films. with Cellular, it’s nice to see him in a different kind of role. and william h. macy is on hand, playing the dopey cop as well. he’s the guy who is trying to help ryan out, only is oblivious to the characters around him. the way he puts together who it was that answered a door for him, at one point in the movie, is way too dependent on coincidences all happening at the same time. he just happened to catch a news broadcast that just happened to show this story where a character just happens to mention not only ryan, but also jessica, the woman he is trying to rescue. it’s way too unbelievable. but that really is the story with this movie. every coincidence is just too neat. when a jessica has the phone underneath a blanket so that her kidnapper can’t hear, ryan is on the other line next to a woman who is blasting her music. and at the exact moment when statham gets jessica to quiet down, so that he can hear the noise of the phone, ryan hits mute on the other end. give me a break. and now statham is suddenly going to forget that he just heard music a second ago? he’s really going to think it’s his imagination and not check under the blanket that is on the floor right by his feet? for all of this movie’s silly coincidences, it still ends up sometimes being kind of fun. the action part of the film gives us plenty of car chases and accidents, and it’s nice to have to good guys with story lines to follow, instead of just one. we follow both ryan and macy’s cop, bob moony, as they race to find jessica as quickly as they can. there are other things that don’t work about this movie, like a surprise villain who is really no surprise at all, if you think about it. name movie stars don’t take small parts in junky movies unless they are going to turn up to be the bad guy and have a bigger role than anyone was expecting. i learned that from a lousy ashley judd film called Twisted. Cellular is a dopey movie, but it still is at times kind of fun. it’s annoying to be able to easily predict not only what is going to happen, but exactly how it is going to happen. when jessica takes on one of these kidnappers herself, that is exactly what goes down. still, as a goofy movie that you don’t have to think too much about, this one is okay. at least it holds your attention, which is a lot more than i can say about some of the very boring movies that just try to be artistic. this movie isn’t trying to be artistic at all. it’s not really trying to be smart either. it is just going for dumb fun, and in many ways it succeeds with that goal.